Get Cashback when you purchase from Flower Advisor! Flower Advisor is an international flower delivery service born in Jakarta, Indonesia. It operates 24 hours and across the world to deliver flowers and other gifts. The Asian countries served by Flower Advisor include India, Philippines, Singapore and Malaysia. It also operates in various parts of Australia and the U.S.A. Flower Advisor’s 24-hour delivery and quality service make it the first choice of its customers. Also, sending flowers is easier with the Flower Advisor app that can be downloaded from the AppStore or Google Play store. The lack of a strong flower delivery service in Asia backdropped the start of Flower Advisor. Today, it is one of the prominent flower delivery services in the world. Flower Advisor is the go-to place for a wide variety of flowers, plants and gift hampers for your friends and family on their special occasions. You can easily explore all the product categories on the homepage and send the best flowers to your loved ones. Flowers: Carnations, hydrangeas, gerberas, orchids, tulips and a collection of other beautiful flowers makes Flower Advisor the best place to find the perfect present. You can buy mixed flowers or hand bouquets, preserved flowers, two tone flowers and table flowers from here. Bloom Boxes are boxes full of attractive, mixed flowers like roses, carnations and eustomas which can be great for surprises. Flower and gift baskets are also available at Flower Advisor. Roses: Flower Advisor has roses of plenty of colours − peach, white, red, champagne, blue, orange, pink, yellow and purple. Hand bouquets and vases with beautiful roses are a choice of products at Flower Advisor. There is also a collection of two-tone roses and mixed roses that you can buy here. Hampers: Gift hampers with fruits and flowers and wellness hampers for a variety of festivals are available at Flower Advisor. 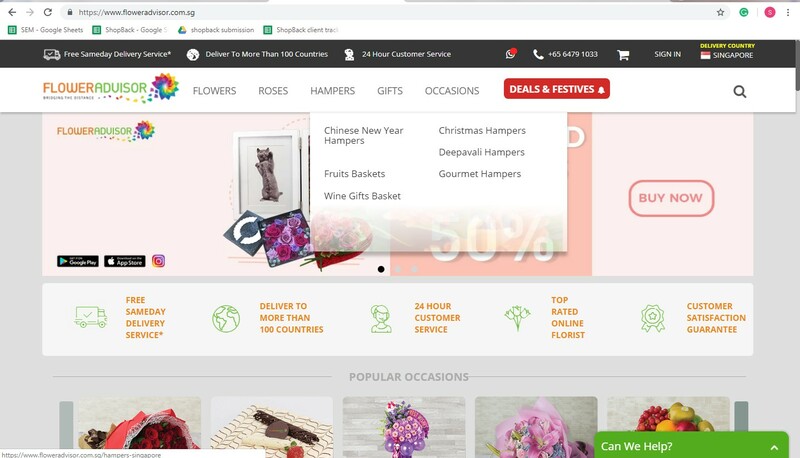 You can send your friends and family exciting hampers on Deepavali, Christmas, New Year’s Eve and other occasions with the amazing delivery service of Flower Advisor. Gifts: Not just flowers, Flower Advisor has you sorted with the perfect gifts for men, women and children. It has a range of gifts for new born babies, a collection of teddy bears and wine accessories. Through Flower Advisor, you can also order and send customized cakes. 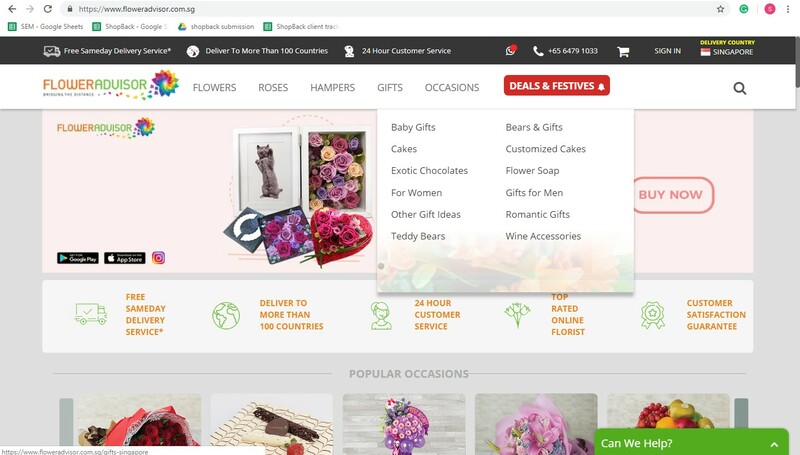 Occasions: Whether it is Christmas or Deepavali, Valentine’s day or Mothers’ day, Flower Advisor has got the best kind of flowers and presents that you can send out to your loved ones. Click on the “Occasions” link on the homepage to view all the options. Also, you can apply a Flower Advisor discount code to make purchases at a lower price than usual. At Flower Advisor, you can find the perfect flowers and gifts to send. With all the products categorized, it becomes easy to find what you are looking for. Also, you can purchase conveniently in only a few steps after signing up or signing in. Step 1: Browse through the categories on the homepage and select one. Step 2: Select one or more products from the product listing page. Here, you can click “Express Checkout” on the product icon to add the product to your cart and go to the checkout page directly. Step 3: Click on the product of your choice to view its details. Select the city where the product needs to be delivered. Click “Add to Cart”. You will be directed to the shopping cart page. Step 4: Click “Proceed to Checkout”. Step 5: Enter your details (name and phone number). Click “Next”. Step 6: Enter the recipient’s details (recipient’s name, email address, street address, city and zip code). Click “Next”. Step 7: Choose the date, time and place of delivery. Any special instructions to be given for delivery can be selected by clicking on the appropriate radio button and entered in the space provided. Step 8: Choose an occasion such as Christmas, Mothers’ Day, etc. and the message to write on the card. Step 9: Finally, select a payment method, enter the payment details and click “Proceed to Payment”. Your order will be confirmed after successful payment. To help you pay conveniently for your orders, Flower Advisor offers multiple payment methods on its website. You can select a payment method and complete your order. PayPal: One of the easy and secure payment methods used across the world today is PayPal. Log in to your PayPal account to make the payment. To do this, you must select PayPal as the method of payment during checkout. Debit and Credit Cards: You can use your Visa, Mastercard or American Express debit or credits card to pay for your order. Enter the payment details such as card number, the name of the card holder and CVV to pay. Flower Advisor discount codes and Flower Advisor coupon codes are available for use during a promotional or festive sale. You can apply these coupon codes to get discounts on your orders. Information about current offers is displayed on the homepage. To view all the deals running on Flower Advisor, click on the “Deals & Festives” icon on the top of the homepage. Flower Advisor coupons can be used to shop at a lower price than usual. The coupon codes can be applied during checkout to get a discount. Follow the procedure below to redeem your coupon at Flower Advisor. Step 1: Click “Express Checkout” on the product icon in the product listing page. You will be directed to the checkout page. 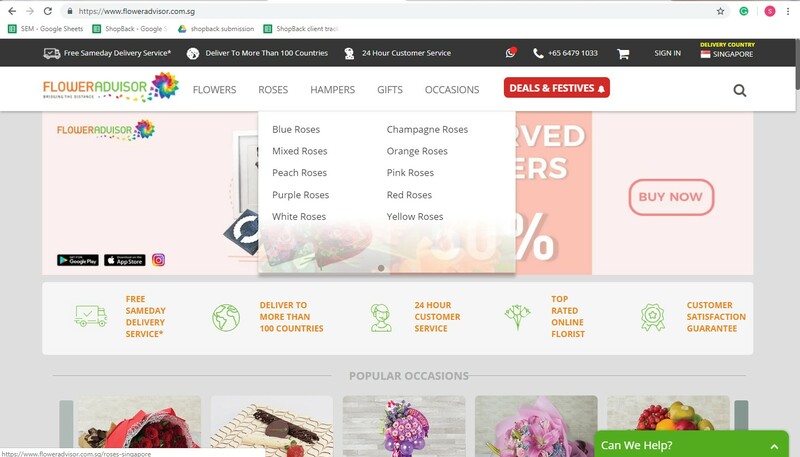 Step 2: On the right side of the checkout page, enter the Flower Advisor discount code in the space provided for “Discount code”. Note: If you are a new user and gained 5000 reward points after signing up with Flower Advisor, you can apply the 5000 (SGD 5) coupon code to get a discount of SGD 5. This amount is deducted from your reward points. Step 3: Click “Apply”. Your discount code will be applied. ShopBack’s amazing cashback offers make it the shoppers’ favourite. On shopping at Flower Advisor through ShopBack, you can get a cashback amounting to 6% of your shopping bill. To avail this great offer, all you need to do is sign up with ShopBack or sign in if you are already a member. Step 1: On the top-right corner of ShopBack’s homepage, click on the Sign Up link to join ShopBack or the Log In link to sign in to your account. Step 2: On the homepage, click on the Home & Living tab. Then, click “View all Home & Living Stores”. Step 3: From the list of all the Home & Living stores available at ShopBack, find Flower Advisor and click on it. Step 4: Click on the Activate Cashback button present on the left side of the web page. Step 5: Click “Continue to Flower Advisor” to visit the website of Flower Advisor. You will be directed to Flower Advisor’s official website and receive a cashback of 6% from ShopBack on shopping. Note: Do not click any other link after going to Flower Advisor through ShopBack. If you do so, your cashback will not be tracked, and you will have to repeat the process. Shipping and Delivery: Flower Advisor delivers 24 hours on all days of the week and has the same-day-delivery option. International deliveries on public holidays depend on the delivery policy of the location. Flower Advisor imposes a delivery charge that is indicated during checkout. Also, if the order was undelivered due to the absence of the recipient at the location or in the case of incorrect addresses, a re-delivery charge is imposed. Cancellation, Exchange and Refund: For cancellations made less than three days before the delivery date, 50% cancellation charges are applied. You are offered alternative arrangements in the case of non-delivery. However, in such cases, no refunds are provided. Also, Flower Advisor does not offer exchanges. Any issues regarding the product quality must be reported within 24 hours of delivery and the issues will be solved by Flower Advisor. Flower Advisor’s customer service is available 24/7 to serve you. Its live chat option on the bottom-right corner of the website can help you get answers to your questions. Click on the window and send a message to chat with a representative. 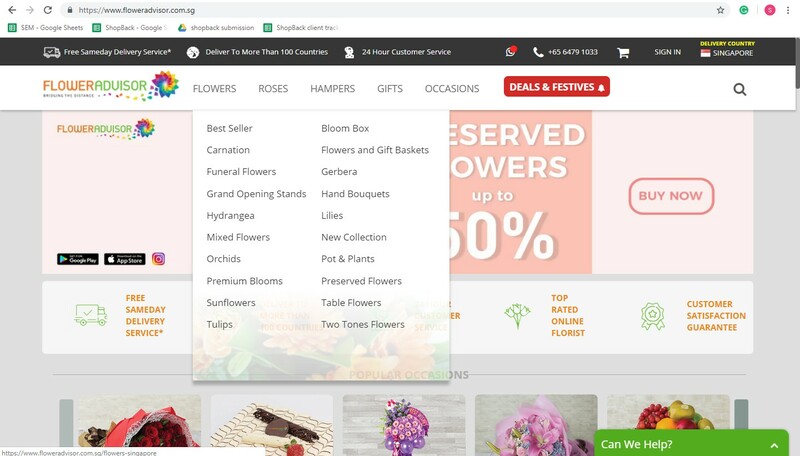 You can also call on +65 64791033 or use Whatsapp Web to connect with Flower Advisor. Click on the Whatsapp icon present on the bar at the top of the homepage to connect through Whatsapp. You can get in touch with Flower Advisor by following their social media pages.